In Harris's Hawks the sexes behave almost like different species. The males are much more aerial and active fliers, the females more steady and direct. We have always flown both in our hunting groups because they compliment one another. Females are generally better on jackrabbits while males excel at hunting birds such as quail. Both are your best choice possible for hunting rabbits, although some falconers who hunt exclusively cottontails in thick cover prefer males. 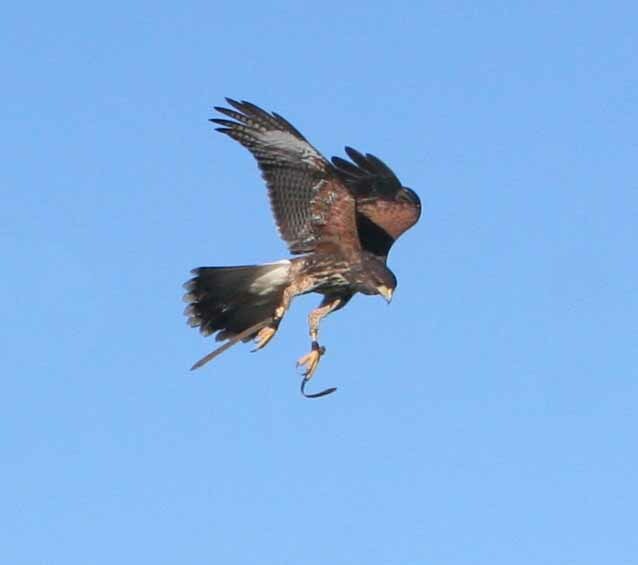 Crow hawking with a male Harris's Hawk can produce some truly awesome flights. Males are more susceptible to frostbite than females, although both sexes are vulnerable to cold and should be protected accordingly. Some have found it easier to train males to hunt with dogs, but both sexes, when socialized properly, will work with dogs.